I drew this from the book “Drawing the Head and Hands” by Andrew Loomis about 3-4 years ago. I haven’t referred back to it since, but next time I draw a baby I will try and remember it!! 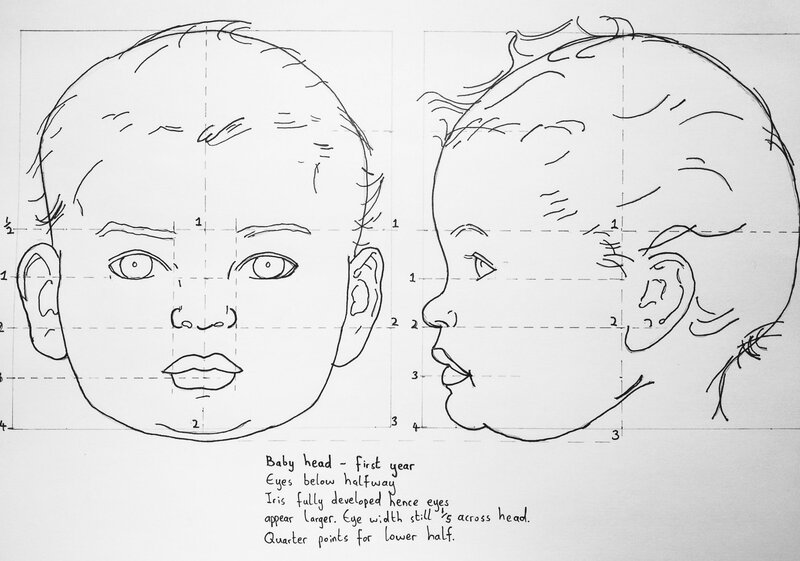 The style of drawing and illustration has certainly changed since the 1950’s, but I’m fairly sure that babies heads are similar proportions. I’ve drawn two babies so far and to that point I hadn’t realized how differently proportioned their heads are, compared to adult heads. Many erasures later, I finally got it right! Yes, I did do the adult head version of this as well – I’ll find it. Of course, everyone is individual so the measurements should always be considered more as a general guide than a rule but if you’re drawing people from imagination (as Andrew Loomis could) then it’s good to have a mathematical reference. Ha! Well observed, observing the absence of him that is. I drew this before I’d designed my logo so it only appears on drawings after that. Now I know you’re looking for it I might hide it more (like behind a tree with your creature). Ha! I’m looking forward to it, that will be great fun!!! PreviousPrevious post: Can anyone guess the car?